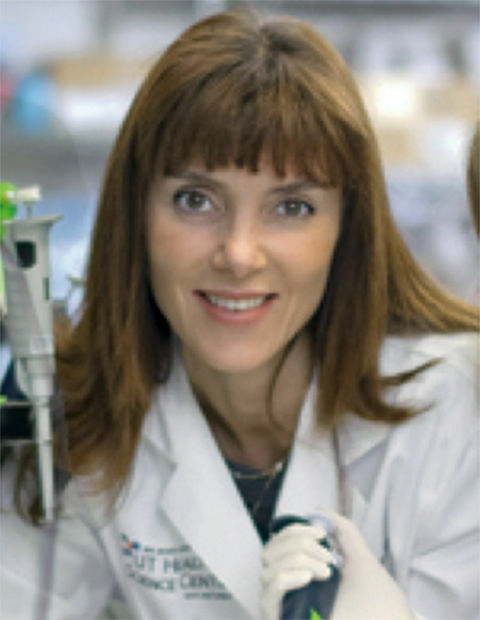 Dr. Veronica Galvan, Ph.D., studies the molecular pathways that link the regulation of brain aging to the pathogenesis of Alzheimer’s disease (AD), and to other neurodegenerations. Her aim is to harness these pathways to delay, treat and prevent Alzheimer’s. Current studies in Dr. Galvan’s laboratory include the elucidation of the role of the target-of-rapamycin (TOR) in neuronal and cerebrovascular dysfunction of AD. In addition to genetic experiments in mouse models, Dr. Galvan tests potential drug candidate molecules with neurobehavioral, in vivo functional and optical imaging as well as cellular and molecular biology tools to determine the effect of these interventions on cognitive outcomes, and to define the mechanisms involved. Other projects in Dr. Galvan’s laboratory focus on the role of TOR in neuronal and cerebrovascular dysfunction in non-diseased aged brain, the role of adult neuronal TOR signaling in the regulation of whole-body metabolism and aging in mammals, and the potential of modulating adult neurogenesis or using neuronal precursor cells generated in vitro for the treatment of brain injury and neurodegeneration. Click here to see a compendium of Dr. Galavan’s mainstream press coverage from around the world.